By a 5-4 vote, the proposed "Employee Hours Tax" on big business to fund homeless services failed, but all indications are that the issue will return very soon. The proposed H.O.M.E.S. 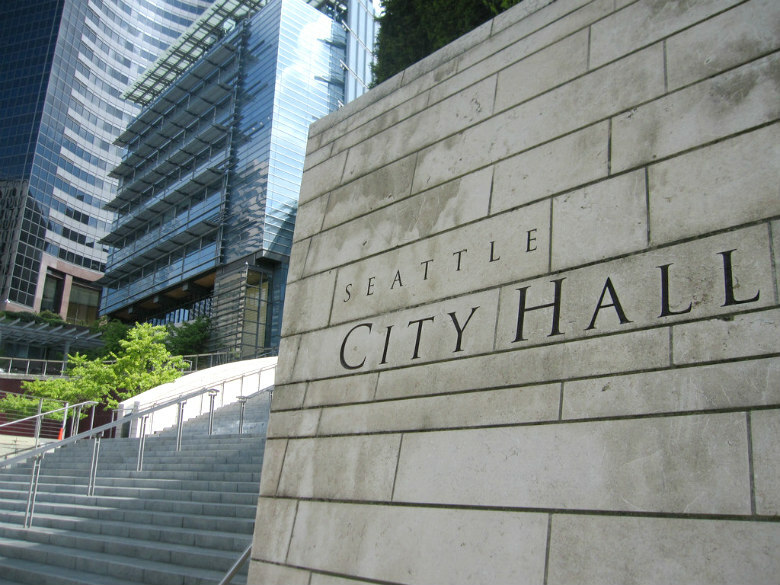 tax, or “head tax” on large businesses that would pay for services to address Seattle’s homelessness crisis was voted down in the Seattle City Council today. Councilmembers Bruce Harrell (District 2), Rob Johnson (District 4), Debora Juarez (District 5), Sally Bagshaw (District 7) and Lorena Gonzalez (Position 9) voted against the tax. Lisa Herbold (District 1), Kshama Sawant (District 3), Mike O’Brien (District 6) and Kirsten Harris-Talley (Position 8) voted in favor. O’Brien and Harris-Talley introduced the proposal. Many of the councilmembers who voted against the tax today expressed support for an employee head tax in general, and suggested returning to the topic in the near future. Specifics of the deal and concerns with the process were mentioned by councilmembers as reasons for voting against the proposal. Bagshaw also said that Mayor-elect Jenny Durkan is committed to working with the City Council on a conversation that will move forward in the next 90 days. Councilmember O’Brien said he planned to work with other councilmembers to return to the issue as soon as December 14, and proposed investing money now to begin setting up the infrastructure to collect a tax of this kind over the next 30 to 90 days, which garnered a positive reaction from many, including those opposed. Elements of the initial legislation changed throughout the process. The larger idea of the proposal — a per-employee, per-hour tax — remained throughout. The original proposal taxes business with gross revenues over $5 million. Today's proposal bumps that up to $10 million, and the per-employee estimate for what the tax would amount to annually was up to $125 from $100. Councilmember Sawant, who expressed fierce support for the proposal and criticized corporate influence, plans to bring a resolution Monday to commit the council to passing an employee hours tax. Councilmember Gonzalez said she’s also been working on a similar resolution with the same goal. More than 90 Seattle business leaders signed a letter to the council expressing “strong opposition” to the tax, saying the tax was hastily proposed and did not take employer input into account, while expressing concern about the rising level of taxes in the city in recent years.